West Henrietta, NY—Lewis Tree Service is proud to have been awarded two 2017 Professional Communications Awards and two safety awards from the Tree Care Industry Association (TCIA) during its 2018 Winter Conference. More than 20 years old, the TCIA Professional Communications Awards program honors marketing and communications excellence for the tree care industry. Lewis’ employee newsletter, the Cutting Edge, was awarded second place in the newsletter/brochure category. Lewis also received a third-place honor in the social media/digital category. Lewis also received two TCIA safety awards in the Outstanding Individual/Crew Performance category which recognizes an individual’s or crew’s heroic reaction to an emergency situation. Jorge A. Reyes Navarrete, General Foreman, was recognized for his exemplary performance during Hurricane Irma storm restoration while vacationing in Cuba; Joel Perdomo, Crew Member, and Juan Fuentes, General Foreman, were recognized for their extraordinary storm response efforts as they left their flooded family homes from Hurricane Harvey to serve others. About Lewis Tree Service: As one of the largest providers of utility vegetation management services in North America, Lewis Tree Service is a leader in safety, responsiveness and innovation. 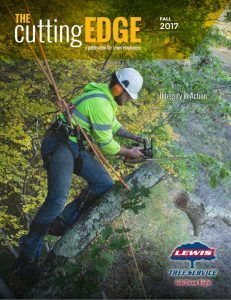 Lewis personnel work in support of many investor-owned utilities, electric co-op and municipal electric utilities, providing a wide range of vegetation management services and expertise including transmission and distribution utility line clearing and outage response resources. Whether working around-the-clock in a storm or reliably managing the ongoing line clearing needs of their customers, utilities count on Lewis to get the job done right. Lewis Tree Service is 100% employee-owned with approximately 4,000 employees in the U.S. and Canada.